Cape Town is one of the most interesting cities in all the world. It has beautiful scenery, wildlife and plantlife that supersedes most other countries of the world if not in beauty then in numbers. Our cultural history is only about 350 years old but the living history of the land and mountains dates back over 540 million years. Most of this history is visible to visitors if they only knew what they were looking at. Africa was once the centre of the universe when all the continents formed the ancient continent of Gondwanaland. During this period of our history the tectonic plates that made up what is today South America was on our doorstep and crashed into the southern coastline of South Africa with the help of the Antartica tectonic plate creating the folded mountains that run along our coastline. This was not a small accident but a major event that caused the southern coastline to fold and create a mountain range that runs about 800 kilometres from Port Elizabeth westwards to what is today Cape Town. When the mountain range reaches Cape Town it makes a right angled dog leg northwards for another three hundred kilometres forming the Hottentots Holland Mountain range and eventually the Cederberg Mountain range. These ranges are to the east of Cape Town and are not connected to the icon of Cape Town “Table Mountain”. 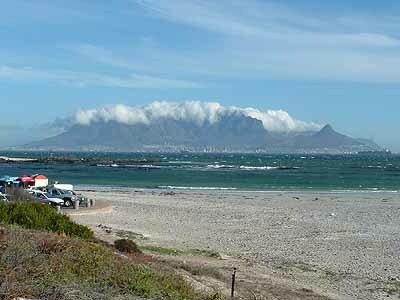 Between the Hottentots Holland Mountains and Table mountain we have the low lying area known as the Cape Flats. This area was once a part of an ancient mountain range which over millions of years was eroded away by water wind and sea. The result of the erosion was that the hardier rock formations that make up Table Mountain were left for us to enjoy today. Table Mountain is made up of a number of different rock formation, the base of which is granite. 540 million years ago this granite was situated between 10 and 15 kilometres underground and through upliftment by forces from the centre of the earth Table Mountain was formed and is kept in place. Granite is created from cooled magma which is pushed to the surface of the earth by volcanic activity. In the Sea Point area granite forced to the surface in its liquid form has mixed with Malmesbury shale and formed some very unique rock formations which were worthy of a visit by Charles Darwin. Table Mountain at its highest point is 1086 metres high but is still growing according to geologists. What keeps it at a constant height is that it is constantly being eroded by wind water and chemicals and the very interesting and hardy fynbos that grows on it. The shales that are found on top of the granite were put there by the sediments that sank to the bottom of the ocean. When the liquid granite was forced to the surface it baked the sediments from below and turned them into rocks. Higher up on Table Mountain we find the sandstone crags. 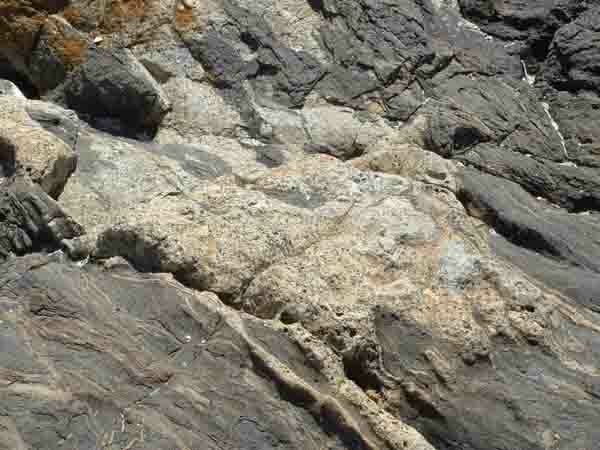 These rocks were formed by sand being deposited from sea action and wind and being baked by the sun and also the heat from the liquid magma rising to the surface. Today areas such as the Twelve Apostle Mountain range give us some spectacular scenery along the Atlantic coastline where water and chemicals over the years have weathered away the softer parts of the rock and created the beauty which one sees. All the different rocks making up Table Mountain add to the beauty and danger of the mountain. Chapman's Peak Drive is one of the most dangerous parts of the Peninsula because it is here where the sandstone which forms large blocks with weak points in them are weathered by water and chemicals suddenly break loose and cannon down the mountain falling onto the roadway. Granite to the human eye appears very strong and just about immune to weathering but having a closer look at the rocks one finds that it does have its weak points. One only has to look at the large boulders and see their rounded shapes which are caused by weathering. 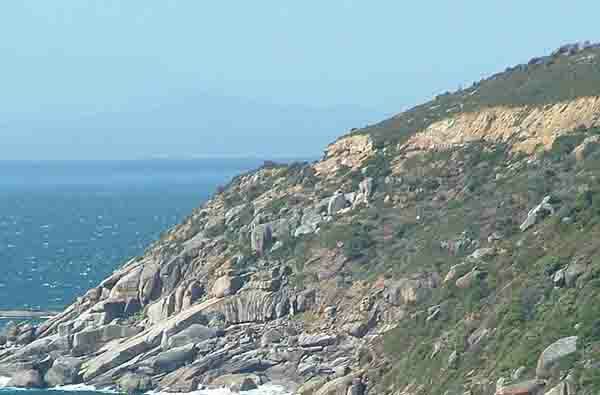 Granite is a bit like an onion and has its different layers which peel away as they weather hence the rounded shapes of most of the large boulders one comes across around the Cape Peninsula. Along the Atlantic coastline we come across a number of areas where we find granite boulders scattered over the terrain. The larger boulders have never moved and have stayed where they were formed, many of the smaller granite rocks once formed part of bigger rocks and due to weathering have broken away and rolled down the slopes of the mountain to where they lie today. Granite is susceptable to chemical breakdown and along the Atlantic coastline we can see plenty examples of rotten granite where the rock has been broken down into brown gravelly type soil. In the Noordhoek area we have two places where the granite has been broken down into kaolinite which is a white clay used in the manufacture of ceramics. This article only scratches the surface of what could be a geologists dream and what to our visitors is one of the best destinations in the world. One can only imagine what the Cape Flats which rests on a bed of shale today once looked like when it was a large mountain range about 1.5 million years ago and which twenty thousand years ago was flooded by the sea making the Cape Peninsula an island. 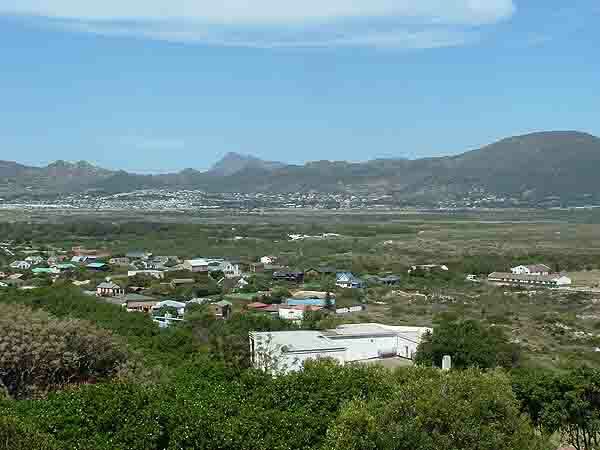 In fact the Peninsula was two islands at the time as the Fish Hoek /Noordhoek valley was also under water. It is difficult to imagine that 1.5 million years ago Cape Town would have been approximately 40 kilometres inland from the sea and today its on the coastline. Does history repeat itself? One can only imagine what will happen in future with global warming. Maybe the sea will rise again and cover the Cape Flats sending all the people living there back to the Eastern Cape. In the meantime Cape Town is still above water and hosting the 2010 soccer world cup. Want to beat the rush, then its time you booked your flights to Cape Town to see what the rest of the world is raving about.